The economic potential of used cooking oil has never been greater. These businesses are profiting from hauling it from restaurants to be turned into fuel and soap. On any given day, Zach Waickman spends a couple of hours on the phone, scheduling pickups of used cooking oil from the deep fryers at DePaul, Northwestern, the Field Museum, the Art Institute and other nonprofits. Waickman has worked at Loyola University Chicago’s biodiesel program for more than a decade—ever since he enrolled in an environmental solutions class as an undergraduate senior in 2007. He and his classmates began attempting to gather old cooking oil from the cafeteria and convert it into biodiesel to help power the shuttle buses that run between Loyola’s Rogers Park and downtown campuses. Today, Loyola’s program collects between 10,000 and 15,000 gallons of the stuff each year and processes it into biodiesel and glycerin soap in an on-campus refining facility off Sheridan Road. “Our biodiesel is sold to our shuttle bus company, and our soap is sold to our housekeeping contractor,” who distributes it to bathrooms across campus, says Waickman. It’s not just high-minded academics and environmentalists who now consider the dirty, smelly “yellow grease”—often strewn with bits of breading—to be liquid gold. “Anyone who owns a deep fryer is going to have waste grease they need to dispose of somehow, and there’s a lot of value in that oil,” says Bob Smith, owner of the Chicago-area franchise of Filta Environmental Kitchen Solutions, an Orlando, Fla.-based company that was founded in England in 1996. Smith says Filta is profitable; 2018 revenue is targeted to hit $1.1 million after growing more than 30 percent each year in 2015 and 2016. He charges his clients an overall fee for filtering oil that can be reused and cleaning the fryers; he does not charge them for removing the used oil. The value in the oil helps him keep prices down for those other services and saves restaurants the hassle of handling hot oil and storing it in big on-site cannisters that can attract rats. 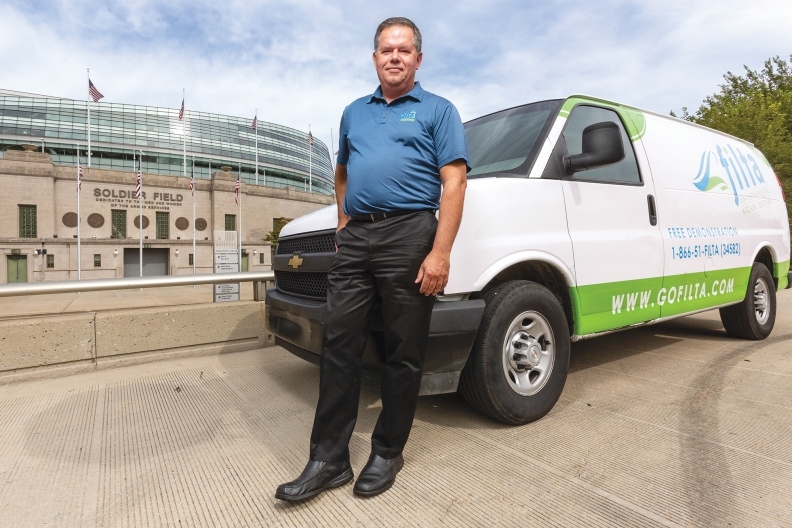 “Working with Filta saves us money,” confirms Sean Hennessy, a Chicago district manager who oversees Soldier Field food operations for food-service giant Aramark. Other oil collectors either charge or pay restaurants for collecting their grease, based on a formula determined in part by the price of yellow grease, which is traded as an agricultural commodity. Grease collected from fryers is food-grade and uncontaminated, and has always had value on secondary markets. Restaurants have long paid grease haulers to remove it; haulers would then sell it to buyers to feed livestock and make cosmetics, soap and other products. One of those haulers is John Mahoney, CEO of Mahoney Environmental, a Joliet-based oil collector founded by his father in 1953. “When I took over as president in the mid-1990s, we focused on our front-end customers—the restaurants and food processors that needed their oil removed,” he says. But that all changed in 2007, when rising global demand for low-carbon fuel and the discovery of used cooking oil’s fuel value prompted him to begin focusing on the back-end energy-industry customers who wanted to create biodiesel. Today, Mahoney focuses on collecting and refining used cooking oil, a high-quality subset of grease that produces low-carbon biofuel. The company removes contaminants and heats and separates the oil before sending it through an evaporator. The water from the process goes through a wastewater treatment plant and is used in organic fertilizer. The oil, meanwhile, goes to centrifuge to be separated into the raw ingredients that are shipped to biodiesel producers. As fossil fuel sources decline and concern about climate change mounts, the economic potential of used cooking oil has never been greater. The U.S. produced 1.57 billion gallons of biodiesel in 2016, up from 516 million gallons in 2009, according to the U.S. Energy Information Administration. Some 6.1 billion pounds of soybeans went into that fuel, compared with just 1.4 billion pounds of yellow grease. But recycled yellow grease has benefits that make it more desirable than freshly processed soybean or corn oil: Unlike the latter two, kitchen grease doesn’t require land, water and other resources to produce. Depending on the production process, some biofuel that relies on soybean oil can actually emit more greenhouse gases than fossil fuels, according to the Energy Information Administration. That’s why Chicago-area restaurants’ dirty fryers will continue to be money bins for some time to come.